In the first issue of this monthly digest series you can find out what important people think about the imminent (killer) robot revolution, which deep learning toolkit might be the fastest on Yahoo's 13.5TB of open-source social media data, how fire-proof drones will soon scour burning buildings for survivors, and much more. Earlier this month, a bunch of important people met in Davos, Switzerland to discuss the current state of AI. Among them were Andrew Moore (Carnegie Mellon University), Stuart Russell (University of California, Berkeley), Angela Kane (United Nations Disarmament Affairs), Matthew Grob (Qualcomm), and Ya-Qin Zhang (Baidu). They stressed the importance of differentiating between human-controlled drones for hobbyists and AI robots used as advanced autonomous weapons in warfare. Kane pointed out that rules must be agreed upon to prevent the development of these killer AI robots. The debate seems ongoing, but at least they all agreed upon that removing humans from war decision-making would have grave consequences. Check out the full discussion in the video above. You are essentially setting up a chess match between the human race and machines that are more intelligent than us, and we know what happens when we play chess against machines. Meanwhile across the pond, the big brains of AI research met at New York University (NYU) to discuss the technical and societal challenges associated with building "intelligent" machines. The lineup was filled with experts from both tech and academia, such as Yann LeCun (Facebook), Eric Schmidt (Alphabet), Mike Schroepfer (Facebook), Amnon Shashua (Mobileye), Murray Shanahan (Imperial College London), and Jen-Hsun Huang (Nvidia). They weren't so much focused on killer AI robots, but focused more on the consumer and research side of things. They were optimistic about the pace at which AI is progressing and its potential for making the world a better place, but were still debating when exactly in the future to expect human-level AI. Back in June 2015, IBM released SystemML to the public, a declarative language to flexibly specify machine learning algorithms. Of course it was only a question of time until other companies would follow suit. A few months later Google made TensorFlow publicly available, a machine learning system optimized for deep learning, but from which any gradient-based machine learning system can benefit. And now you can add Microsoft to the list. This week Microsoft announced the Computational Network Toolkit (CNTK), a unified computational network framework that describes deep neural networks as a series of computational steps via a directed graph (much like its competitors). Actually, the CNTK was first introduced at the ICASSP conference in April 2015, but was only available via Codeplex under a more restricted open-source license. But now the code is on GitHub under (what reads like) a MIT open-source license, which is good news for a number of reasons. Interestingly, they benchmarked their software against other popular deep learning toolkits, such as Theano, TensorFlow, Torch, and Caffe. They compared the raw computational efficiency across toolkits using simulated data (fully connected 4-layer neural network, mini-batch size 8192) on systems with up to 8 GPUs. The number of frames each toolkit can process per second is illustrated in the chart below. CNTK compared favorably in computational efficiency for distributed deep learning (4 GPUs or 8 GPUs) on all tested toolkits, and can scale beyond 8 GPUs across multiple machines with superior distributed system performance. Sources: Official Microsoft Blog, technet.com, Wired. Meet FAROS, a Fireproof Aerial RObot System, developed by the Korea Advanced Institute of Science and Technology (KAIST). The drone is built specifically for fires inside skyscrapers, so that it can go where humans can't (or shouldn't). Not only can the drone navigate auto­no­mous­ly (2-D LiDAR sensor, altimeter, Inertia Mea­sure­ment Unit sensor), it is also fireproof and flame-retardant. The drone's body is covered with aramid fibers to protect its electric and mechanical components from the direct effects of the flame, so that it can scour burning buildings for survivors. 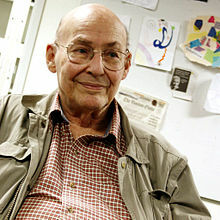 I'm sure you've heard by now that Marvin Minsky, one of the founding fathers of computer science and AI, has passed away. As co-founder of the MIT AI laboratory, Professor of E.E.C.S, Media Arts and Sciences (now known around campus as "Old Man Minsky"), he received a number of awards (among them the ACM Turing Award) for his lifework. He wrote two classic books ("The Emotion Machine" and "The Society of Mind"), built the first neural network simulator (SNARC), but also had an impact on pop culture such as the writings of Isaac Asimov and the movie "2001: A Space Odyssey". He strongly believed that there is no real difference between humans and machines, as humans can be understood as a kind of machines whose brains are made up of many semiautonomous but unintelligent "agents". You don't really understand something if you only understand it one way. Sources: MIT, NYTimes, Discover Magazine. This year's ICDAR conference took place from January 12 - 13, 2016 in Johannesburg, South Africa. Some noteworthy papers are listed on the conference's website. Among them are quite a few on Arabic handwriting recognition, using either Artificial Neural Networks or Dynamic Bayesian Networks. Wavelet neural networks, a class of networks that combine convetional sigmoidal neural networks with wavelet analysis, seem to continue to be popular. They have been used in a variety of application fields, such as signal classiciation, time-series prediction, signal denoising, and nonlinear static function approximation. This year's ICDAR sees additional applications for EEG signal classification and control chart pattern recognition (among others). Lenovo and Google announced at CES 2016 that they are collaborating to develop the world's first consumer-ready smartphone that features Project Tango's 3D augmented reality technology. According to TechTimes, the phone will be less than 6.5 inches in size and be equipped with a Qualcomm Snapdragon chipset. As for the cameras, it will be packed with a depth camera, a fisheye lens and an RGB camera, which will be set vertically to support portrait mode rather than landscape. Samsung announced a couple of smart devices that are not limited to TVs and refrigerators, but will now also include Welt: the world's first smart, wearable healthcare belt that also seems to have the world's most awful gadget name. The Scientific American reports that NASA is now using a Global Hawk, a high-altitude long-endurance drone, to study El Niño. Researchers at MIT are trying to use quantum computing to solve some of the major technological challenges that come with Big Data. Conventional computers struggle with the immensely complex topological structures of big data sets such as the internal wiring of the brain, the U.S. power grid, or the global interconnections of the Internet. Quantum computing could exponentially speed up these calculations. Yahoo released 13.5TB worth of (anonymous) social media data, collected from about 20 million users between February 2015 to May 2015. The Yahoo News Feed dataset is a collection based on a sample of anonymized user interactions on the news feeds of several Yahoo properties, including the Yahoo homepage, Yahoo News, Yahoo Sports, Yahoo Finance, Yahoo Movies, and Yahoo Real Estate. Let's hope your private data is not among it. Paul Misener, Amazon vice president for global public policy, was interviewed by David Pogue of Yahoo about their Amazon Prime Air delivery drone concept. Gizmodo reports that the German Aerospace Center has developed a system that allows a drone to autonomously land on a moving car that’s equipped with a roof-mounted net. 30th AAAI Conference on Artificial Intelligence, February 12–17, Phoenix Convention Center, Phoenix, AZ, USA. 2016 MIT Tech Conference - The Rise of Artificial Intelligence, February 20, MIT Media Lab, Cambridge, MA, USA.